← Once saved, NOT always saved . . .
Hebrews 8:6 (NIV) 6 But the ministry Jesus has received is as superior to theirs as the covenant of which he is mediator is superior to the old one, and it is founded on better promises. Hebrews 8:6 (AMP) 6 But as it now is, He [Christ] has acquired a [priestly] ministry which is as much superior and more excellent [than the old] as the covenant (the agreement) of which He is the Mediator (the Arbiter, Agent) is superior and more excellent, [because] it is enacted and rests upon more important (sublimer, higher, and nobler) promises. Hebrews 8:6 (TEV) 6 But now, Jesus has been given priestly work which is superior to theirs, just as the covenant which he arranged between God and his people is a better one, because it is based on promises of better things. Hebrews 8:6 (KJV) 6 But now hath he obtained a more excellent ministry, by how much also he is the mediator of a better covenant, which was established upon better promises. Hebrews 8:6 (NASB) 6 But now He has obtained a more excellent ministry, by as much as He is also the mediator of a better covenant, which has been enacted on better promises. νόμος nomos: Law, rule, principle. τίθημι tithēmi : To put, set, place, lay down. So what is this “combined” word and why is it so important? To answer this, we must first understand what is being said above. We must understand some of the concepts being used above. The following is going to be hard to understand if you are unable to recognize that Greek society was NOT a society that followed, or even acknowledged, the existence of the great I AM. They had their own gods – many of them. Adonai was NOT among those gods! Many of the Greek words used in text are inadequate and fall woefully short of the meanings that are trying to convey from the Hebrew text – a text and language that DOES recognize Adonai as the great I AM. Society 1 – It has a single word for death. It has a single understanding of what death is. It’s understanding of death, and therefore its definition of death, is that death is a cessation of life, brought about by their god, as a result of doing something that displeased their god. They do not as a society believe in an afterlife. Therefore, death is final. You cease to exist as a result of your death. Society 2 – This society also has a single word for death. However, its understanding and definition of what death is has substantive differences from the Society 1. Society 2 believes death is a reward from their god and not a punishment. Society 2 believes that the reward of death results in them being transformed into a god themselves after that death. Both societies have a single word for death. Both societies have a very different understanding of death (even if some parts are similar – both believe death is initiated by their god). If Society 2 had a religious book that used the word death many times in its teachings and had their religious text that uses their understanding of death translated into the language of Society 1, would Society 1 understand these teachings properly if they applied their own understanding of death to the religious writings of Society 2? Of course not! And yet, what choice do they have when translating? There is only one word for death in each society. One of the ways you could explain the differences, is to write a letter (epistle) to the people of the other society explaining the proper understanding of what death is and how to change their lives according to that new understanding. In classical Greek diathēkē exclusively denotes a “last will or testament.” It is considered a legal, technical term for that agreement. The problem with the Greek is that it does NOT covey the meaning of covenant fully or accurately because IT CAN’T! The reason that it can’t is because it was not a word that that the Greeks created based upon an understanding of Adonai and His promises. It is a word that was instead created and based upon a Greek society and its own values – values that did NOT include an Awe and Reverence of the One True God Adonai which the true meaning of covenant MUST include to be understood fully. A foundational concept of covenant is the notion of legal contract. Legal contracts are developed to establish and regulate a relationship where none previously existed. the Bible’s imagery of covenant focuses primarily on the covenant between God and humankind. Leland Ryken, James C. Wilhoit, Tremper Longman, ed., “Covenant,” in Dictionary of Biblical Imagery, (Downer’s Grove, IL: InterVarsity Press, 1998), WORDsearch CROSS e-book, Under: “Covenant”. This is a key understanding of covenant! We have had to go the long way around the barn to make sure that we are all on the same page. I don’t want there to be any misunderstanding about intent or about what is being said. The biblical writers chose the best possible word to translate, but often had to explain and sometimes change the Classical Greek (secular – non-biblical) understanding of the word so that it conveyed the Hebrew understanding properly. They did this so that the reader could understand the the subtle and sometimes not so subtle changes that the Hebraic concept behind the word as it applied to Adonai demanded/demands. The no may not be so easy to see based on the translations above . . .
You see, what none of the translations above point out in their translation is the law part. While a couple use enact and establish in their translation, all leave out the 2nd part: law. Ironic since νομοθετέω nomotheteō is a combination of nomos – Law, rule, principle and tithēmi – To put, set, place, lay down. Pardon the double entendre, but they have laid down the law. From nomos (3414), “law,” and tithēmi (4935), “put,” nomotheteō means to “frame laws” or “to put something into law.” The word appears from about 400 B.C. in the work of such classical writers as Lysias, Xenophon, and Plato. It continued in frequent use on into New Testament times. A general meaning of the term is “to legislate,” sometimes in the sense of “enacting” laws in general and sometimes “establishing” something specific by law, or to settle something legally (see Gutbrod, “nomotheteō,” Kittel, 4:1090). The New Covenant is established as law based upon κρείττων kreittōn (Superior, better, more advantageous) ἐπαγγελία epangelia (promises). I realize that this flies in the face of those that believe that we are “no longer under the law.” What you should be studying and trying to understand is what that “no longer under the law” actually means. Yeshua (Jesus) said the most important command in the text was to love God with all of our our strength, heart, mind and soul. He said the 2nd most important command was to love your neighbor as yourself. Both of these are commands from the Torah (the Hebrew word that nomos above translates as law). Do you think heaven is in your future if you don’t love your neighbor (per the Torah/law)? 20 If anyone says, “I love God,” and hates his brother, he is a liar. Do you think heaven is in your future if you don’t love God (per the Torah/law)? Can you remain united in Him without obeying him? 24 Those who obey his commands remain united with him and he with them. Here is how we know that he remains united with us: by the Spirit whom he gave us. when we love God, we also do what he commands. and “inform” (Deuteronomy 17:10) reflect the Hebrew reading in each case. Deuteronomy 17:10 (CJB) 10 You will then act according to what they have told you there in that place which Adonai will choose; you are to take care to act according to all their instructions. Two apocryphal uses (2 Maccabees 3:15; 4 Maccabees 5:25) refer to God as the One who “legislates” or who gives men laws to live by, thus reflecting the more common meaning of nomotheteō. 2 Maccabees 3:15 (KJVApocrypha) 15 But the priests, prostrating themselves before the altar in their priests’ vestments, called unto heaven upon him that made a law concerning things given to he kept, that they should safely be preserved for such as had committed them to be kept. horalf Gilbrant, ed., “3412. νομοθετέω,” in The Complete Biblical Library Greek-English Dictionary – Lambda-Omicron, (Springfield, MO: Complete Biblical Library, 1991), WORDsearch CROSS e-book, Under: “3412. Î½Î¿Î¼Î¿Î¸ÎµÏ„á½³Ï‰”. Adonai teaches, Adonai informs, Adonai gives commands, Adonai loves – He is the definition of love! This is what the Torah (nomos or law in Greek as it is informed by the Hebrew) is: loving instruction from a loving father. In the New Testament nomotheteō occurs twice, both times in Hebrews. Hebrews 7:11 states that the Hebrew people “received the law (nomotheteō)” under the Levitical priesthood, reflecting the word’s normal passive meaning when used of people. . .
Hebrews 7:11 (CJB) 11 Therefore, if it had been possible to reach the goal through the system of cohanim derived from Levi (since in connection with it, the people were given the Torah), what need would there have been for another, different kind of cohen, the one spoken of as to be compared with Malki-Tzedek and not to be compared with Aharon? 6b The New Covenant has been given as Torah. This is a virtually unknown theological truth of far-reaching importance. First, although there are many, both Jews and Christians, who suppose that the New Testament abrogated the Torah, the New Testament here explicitly states that it has itself been given as Torah. Obviously, if the New Testament is Torah, then the Torah has not been abrogated. Instead, the New Testament has been given the same status as the Torah of Moses; that is, it has come to have the highest authority there is, the authority that accompanies promulgation by God himself. One might say that Torah has been expanded—or, better, that Torah has been made more explicit (compare Mt 5:17-48&NN). Second, the fact that the New Covenant has been given as Torah means that a Jew is not Torah-true, he is not a Torah-observant Jew, unless he accepts the New Testament as Torah. A Jew who considers himself shomer-mitzvot, “an observer of [the] commandments,” is deluding himself if he does not obey the New Covenant. Unless he trusts in Yeshua as Messiah and as his atonement for sin, he is disobeying Torah. And third, it means that a Gentile grafted into Israel by his faith in Yeshua the Messiah (Ro 11:17-24, Ep 2:8-16) has himself come into the framework of Israel’s Torah. Although what this Torah demands of him differs from what it demands of a Jew (see Ac 15:20&N), a Gentile Christian should never think of himself as “free from the Law,” as many do. That the New Covenant has become Torah is absolutely crucial for understanding the New Testament. Yet, so far as I know, not one existing translation brings out this truth; nor, to my knowledge, does any commentary so much as mention it. In fact, the issue is avoided altogether. To give a typical example, the Revised Standard Version in this verse says merely that the New Covenant “is enacted” on better promises. Also, every place in the New Testament or the Septuagint where there appears a compound word related to “nenomothetêtai” it always has to do with “Torah” and never with “law.” At Ya 4:12 the word “nomothetês,” the noun formed from the verb used in our verse, is used to describe God as the “one Giver of Torah, with the power to deliver and to destroy.” At Ro 9:4 “nomothesia,” the verbal noun (gerund), is rendered “giving of the Torah.” In the Septuagint “nomothetein” which is the active voice of the verb in our verse, is used more than a dozen times to mean “instruct,” the context always implying “instruct in Torah” (and at the same time implying that instruction in Torah involves not only the legal component but the full range of God’s “Teaching”—the literal translation of “Torah”). The word in our verse appears at only one other place in the New Testament, 7:11 above, where we read that the Jewish people “nenomothetêtai,” that is, “were given the Torah.” At 7:11, every translation, without exception, takes the “nomos” in “nenomothetêtai” to be not “law” in general but “Torah” in particular—no one thinks an early version of the Knesset (the legislative body of the State of Israel) met on Mount Sinai to pass laws. But in the present verse, even though “nomos” and its compound “nenomothetêtai” nowhere in the entire book of Messianic Jews refer to “law” in general, but always to “Torah” in particular, not one translator or commentator has grasped the point that the New Covenant has been given as Torah. I have enough paranoia to find this more than just an oversight. Although today there is likely no conscious ill intent, I am convinced that the failure to translate “nenomothetêtai” correctly is the evolved consequence of an earlier perverse unwillingness on the part of Christians to recognize and emphasize the Jewishness of the New Testament. This perversity resulted from the wrong theology that regards Christianity as a religion separate from Judaism, having superseded it, and which regards Judaism as a dead religion, whose Law, whose Torah, ceased to be operative when Yeshua came. Like the translation of “telos” in Ro 10:4 as “termination” instead of “goal,” the failure to see that the New Covenant has been given as Torah reflects, even if unconsciously, the antisemitism which came to pervade the Christian Church during the centuries after it had drawn away from its Jewish roots (see Ro 10:4N). For more on refuting this erroneous theology, which became endemic in the Church, see references on Replacement theology in the last paragraph of Mt 5:5N. I challenge non-Messianic Jews and Gentile Christians alike to recognize that the New Testament has been given as Torah, to recognize the three implications of this fact stated in the three initial paragraphs of this note, and to draw the appropriate conclusions. David H. Stern, Jewish New Testament Commentary, (Clarksville, Maryland: Jewish New Testament Publications, Inc., 1992), WORDsearch CROSS e-book, 687-689. A lot of stuff to unpack, huh? My advice is to pray and ask for guidance. Let the Holy Spirit guide you because if the New Covenant is given as Torah, many theological suppositions (dogmas, theories) are in jeopardy. Be blessed and continue to check EVERYTHING against the text just like the Jews in the synagogue at Berea did! This entry was posted in Word Studies and tagged law, New Covenant, torah. Bookmark the permalink. 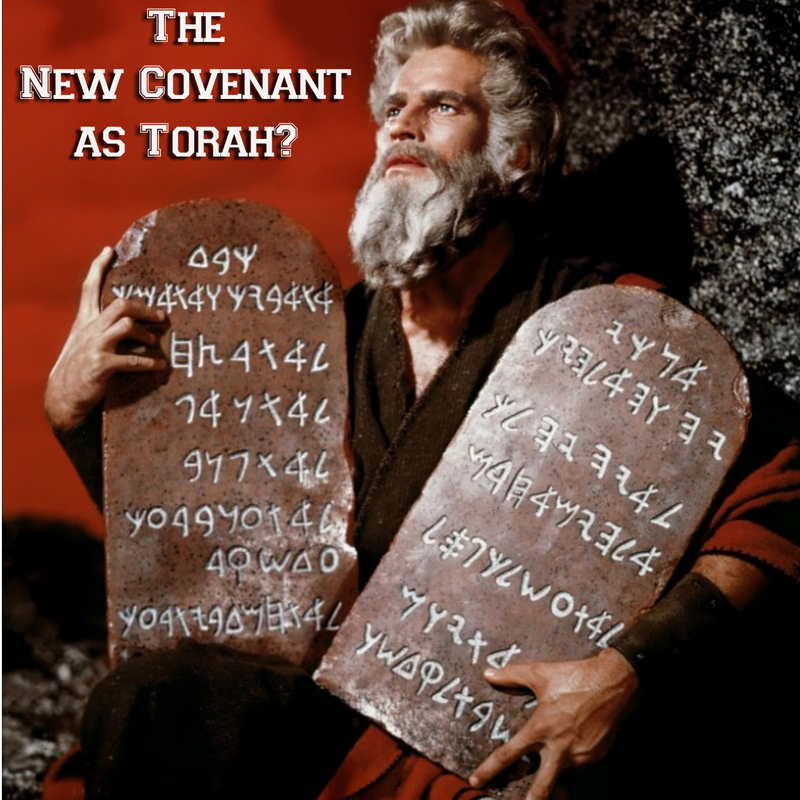 3 Responses to The New Covenant given as TORAH? this was a great breakdown of that word – exactly what i was looking for. Matthew Nolan briefly mentioned this in a series on Galatians and this brought it home for me! thanks for the info!